I love a side dish of peas but often find them a bit bland or lacking (and in need of more nutritious veggies mixed in there). 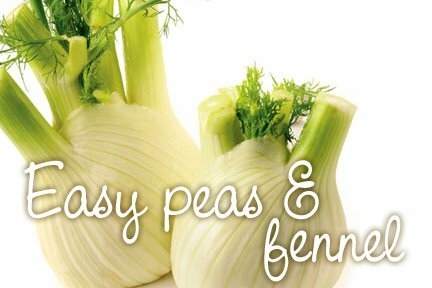 Fennel has a lovely, fragrant flavour that gives those peas some oomf! Cut the fennel bulb in half, between the more prominent stalks. Put one half away, and cut the remaining half in half, then slice each quarter into thin crescent slices. In a large saucepan, heat ghee until melted. (If you don't have ghee you can use olive oil, coconut oil or butter, but ghee is Ayurvedically a very good fat to cook with for all doshas.) Add sliced fennel and stir well, cooking covered over medium heat for 5 minutes to soften. Stir in peas and season with salt and pepper. Cook covered for 5 more minutes, adding a splash of water if it's drying out or sticking to the pot. Stir in mint and serve! What to do with that leftover fennel bulb? Why, make Quinoa Tabouli Salad, of course! Great for all doshas! KAPHAS reduce ghee or oil to 1 tsp. If you are say pita/vata and low on Kapha does that mean that you should eat foods recomended for Kapha diet to boost your kapha? Or, should you eat pita/vata foods to balance your kapha? Oh and your advice that you gave to me last week....man I was not expecting that door to open to that room!!!! If you are, say, pitta/vata and low on kapha, you should eat a pitta/vata diet meaning it recommends foods FOR pittas and vatas, which naturally contain Kapha elements in order to balance the pitta and kapha. As a pitta (fire/water), you need cooling drying foods (vata & kapha), but as a vata (cool/air) you need heating foods (pitta & kapha), so kapha foods would be common to both pitta and vata, obviously, and kapha foods are those that kaphas should avoid, because like increases like. Have I completely confused you now???? So I should eat Kapha inducing foods since my pita and vata are equal but my kapha is low? Exactly! So if you go to this web page that lists what Kapha's should and shouldn't eat, you should eat according to the list that Kaphas shouldn't eat (because these are kapha-increasing foods, which Kaphas need to avoid). The reason it's confusing is because you're looking at it beyond just what pitta/vatas should eat and seeing that you should therefore eat kapha foods. Does this help? "Easy Peas and Fennel" was selected by JoyfulBelly as one of our "Creative Dishes" for December. Your entry was posted on April 26th. When we visited your website we were pleasantly surprised to find a new, incredible chef re-inventing Ayurvedic cuisine. We appreciate what you're creating for the world! Please nominate other great chefs creating the new food revolution. We rely on our readers for suggestions! I hope you love our website http://www.joyfulbelly.com. We would be very happy if you posted a link from your website to ours and wrote to us with your feedback. This means that you actually get rid of fat by eating Coconut Fat (also coconut milk, coconut cream and coconut oil).